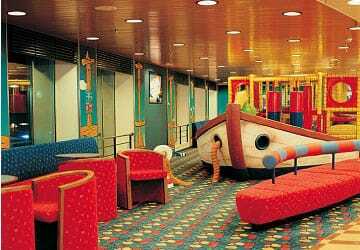 The Moby Vincent cruise ferry is a big ship featuring a high standard of onboard facilities which include a bar, cafeteria, self-service restaurant, boutique, video games room, a selection of cabin accommodation, coach style seats, a children’s play room, sun deck and much more. Cabin accommodation comes in a variety of 2 and 4 berths with a choice if inside and sea view ('outside'). Coach style seating is available for those who'd prefer not to book a cabin. There's a choice of places to eat on board the Moby Vincent including a self-service restaurant offers a range of freshly cooked delicious dishes if you only want a snack or a drink then head to the cafeteria. 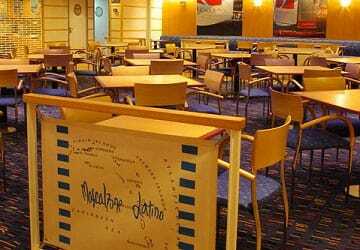 You can have a drink in the ships bar or if you want to enjoy a cold drink while topping up your tan then head to the Lido bar on the sun deck. The Moby Vincent features an onboard shop that sells amongst other things clothing, children’s toys, maps, magazines and books. You can kick back and soak up the sun or enjoy the fresh sea breeze on the sun deck. 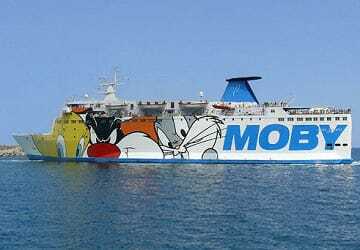 If you are travelling with children then travelling with Moby Lines will be a trip into the world of imagination, not least due to the Looney Tunes branding and figures which can be found everywhere onboard. The Moby Vincent has a dedicated children’s play room as well as a video games room bursting with games for older children. Please Note: Whilst we have taken great care in making our Moby Vincent guide as accurate as possible, onboard facilities, services and entertainment may vary depending on the date and time of year that you travel, facilities mentioned may change without notification and ferry companies reserve the right to operate vessels other than those mentioned at time of booking without prior notification. Clean ship and helpful staff. We have good experience with Moby Lines. Both the outward and return trip were pleasant. 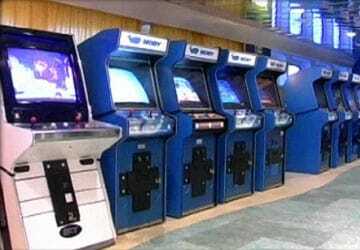 All neatly arranged and on time. 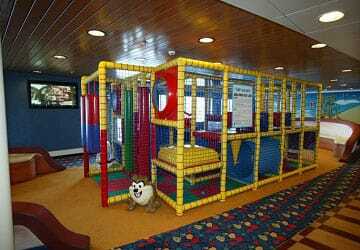 There are sufficient facilities on board to keep yourself and the kids busy. We had a dog with us and that worked out fine as well. Friendly staff on board (Italians). "Ferry trip from Livorno to Bastia"
We walked to the ferry in pouring rain in Livorno and we soaking wet by the time we arrived to the ferry. 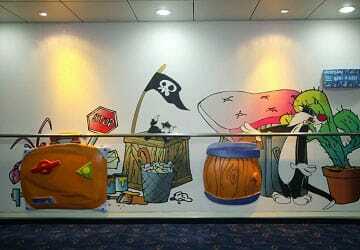 A bit confusing how we would get on board the ferry, but we managed to sort it out. The ship was not very well suited for passengers traveling with suitcases as it was very narrow on car deck between the cars. We got on board through car deck so we had to go through there. Previously heard many stories about how chaotic and busy the port of Livorno is. Everything went well. The night before departure, we picked up our tickets and checked out the area. The next morning at half past seven, we arrived to the port and went on board. 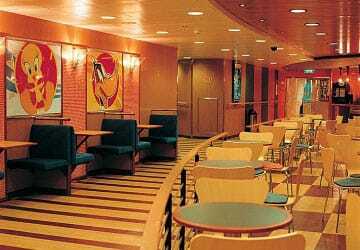 The ship was different from the ferries in the Netherlands, it had passenger decks above each other. The trip was great with plenty of sun loungers on the outside deck, and most important of all, there were no delays. Both the outward and return journey with Moby was enjoyable. Excellent crossing. During check-in in Livorno, there was a heated discussion about the height of the caravan. On the confirmation, the height of the caravan was 2,60m, en 1,80m for the car. Moby Lines had a vehicle height og 2,60m which I didn't agree too. We had a long argument about this but we were later allowed on board. The ship was not crowded. On the return leg, we arrived with the same confirmation and same vehicle but the agents didn't give us a hard time during check-in. A very pleasant, smooth trip. Most enjoyable. "Share your experience - Livorno and Bastia with Moby Lines"
"Crossing from Livorno to Bastia "
"Crossing from livorno to bastia"
Boat was on time. Staff was helpful. Crossing was smooth. Loading and disembarkation was efficient. It was a very successful first experience. 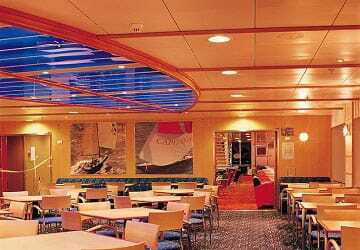 Punctual, clean and well organised during boarding and disembarkment. See you next time. The restaurant cuisine was similar to a cantine's. The colour balls in the children area were dangerous and there was no age limit for older children. Some kids between 8 and 12 were left unattended by their parents and were putting the youngest in danger. There was a 30 minutes delay. A very pleasant night crossing, the cabin was clean. The bar had a singer. I recommend this company. "Cabins were not good, otherwise ok"
Vi took advantage of sleeping in the cabins from the night before as the ship was departing at 0800 in the morning. The cabins were claustrophobic and not very comfortable. 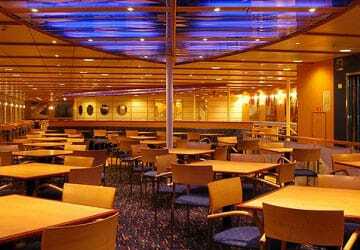 There was a self-service restaurant on board where the food was good and service excellent. A good first experience in Corsica. A first trip aboard a ferry. My fears about that trip disappeared very quickly. Everything was fine : a good organisation, a good boarding, a pleasant journey, the opportunity to eat, games for the kids, a lot of space. The return journey from Bastia was even better with a LED pannel to indicate the gates. I will go to Corsica again next year with Moby Lines. 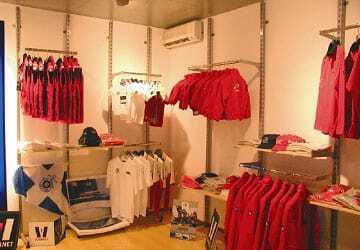 Well organised, punctual and confortable. We had tow pleasant crossings from Livorno to Bastia and back two weeks later. The on-board facilities were fine. During the outward journey we sat on deck and enjoyed the sea and sun. We spent the return journey inside in a nicely cool area and, to our surprise, free WiFi. The only downside was the sign posting in Livorno, it is one big Italian chaos. Travelling with Moby is definitely recommended. One of the cheapest and punctionality and tidyness was in order.